Casino Cruise is a site steeped in elegance and decadence. Its design theme is very much based on the luxurious and exclusive, as its name would suggest. The suggestion that all online casino players have dreams of being high rollers may be patronising to some, but it will be very tempting to others. 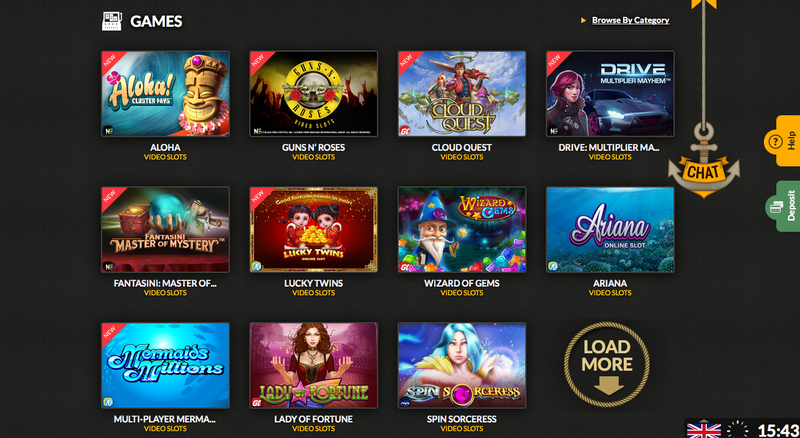 And against other sites that take a similar approach, the design at Casino Cruise is a lot more subtle, and a great deal more pleasant to look at. The (loose) concept of the site is that you are aboard a cruise, and the site takes the place of the casino that you would (obviously) spend all of your time at on such a vessel. An easy site to navigate, with only three tabs (‘games’, ‘promotions’, and ‘about’), casino Cruise manages to avoid the over complicated nature of many online casino sites, and make accessibility easy for even the greenest of newbies. But the concept is only the beginning, what truly matters, what decides whether people will keep coming back, is the choice of promotions and the choice of games. If you’re a slots fan, then some of the best looking video slots around are waiting for you at Casino Cruise. James Dean, Jack’s Beanstalk, Stardust, and TV themed video slots including Bullseye are all at your fingertips. There’s also a host of classic slots if you prefer a simpler experience. Casino games are also present in abundance, including poker, baccarat, and roulette in many different forms. For the poker fan though, perhaps the video poker section will be more of interest, where there is a veritable smorgasbord of video poker games to try out. With keno and bingo amongst other games available and a fair few jackpot games to pick from, Casino Cruise has a pretty good collection for you to choose from. The truth is, this is simply a very good site. The concept may not be overly original, but it is carried through every single aspect of the site from design, to navigation, to gameplay, to promotions. This is a site that has been designed with the player in mind, and due to this Casino Cruise can offer a very pleasant and entertaining experience to newbies and experienced veterans alike, well worth a visit for players of all levels.